With its impressive success rate in terms of student employment (currently at an average of 70%), increasing press attention and ever-expanding portfolio of high-flying partnerships, it’s hard to believe that Hotel School has been in business for little more than a year. The Belgravia-based charity is an innovative collaboration between the 5-star Goring Hotel and The Passage homeless resource centre, created to help disadvantaged people from a range of backgrounds into secure employment in the hospitality industry. Held three times a year, the comprehensive 12-week programme includes classroom training in service, presentation and general working skills, as well as practical demonstrations in cookery, housekeeping, barista and bar work from partners such as the East India Tea Company and Extract Coffee Roasters. The educational course, combined with work experience placements at some of London’s top hotels and topped off with a glittering graduation ceremony, has proved the perfect recipe for breaking patterns of unemployment and building a brighter future for many facing uncertainty and homelessness. This summer, Hotel School took centre-stage in a spotlight piece on BBC London News. It was an incredible opportunity to spread awareness of their life-changing work. The feature followed the progress of now-graduate, Chris Hunt, who joined the programme after a break-up left him homeless and unemployed. The feature also aired interviews with Hotel School co-founders, Mick Clarke (CEO of The Passage) and Jeremy Goring (CEO of The Goring). 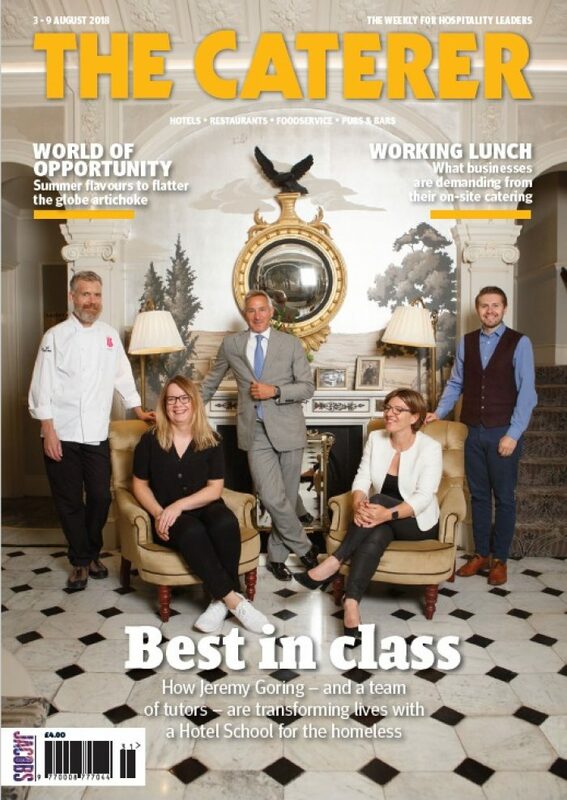 Hotel School has also been the subject of a six-page feature – including the front cover – in The Caterer magazine, targeted towards professionals across the hospitality industry. The team enjoyed a fun photo-shoot session at The Goring and were delighted to be recognised with the headline, “The School of Life”. The article included testimonials from past students, with one describing the course as “an invitation into the hospitality industry”. Lucy Purdy, Editor of Positive News magazine, a publication which aims to spread the word of sustainable and socially positive initiatives around the world, took interest in Hotel School’s pioneering methods. Lucy interviewed the Hotel School’s “headmistress”, Veronique Bonnefoy, formerly head of training for Gordon Ramsey. In the resulting full-page feature, Ms Bonnefoy made it clear that she passed on her rigorous standards to Hotel School students and refuses to take a “softly, softly” approach. London Live, the 24 hour entertainment channel devoted to London, broadcast a piece on Hotel School over their television and online platforms. The London Live crew sat-in on one of Véronique’s practical classroom sessions, where the lesson of the day consisted of how to produce the perfect banana flambé. 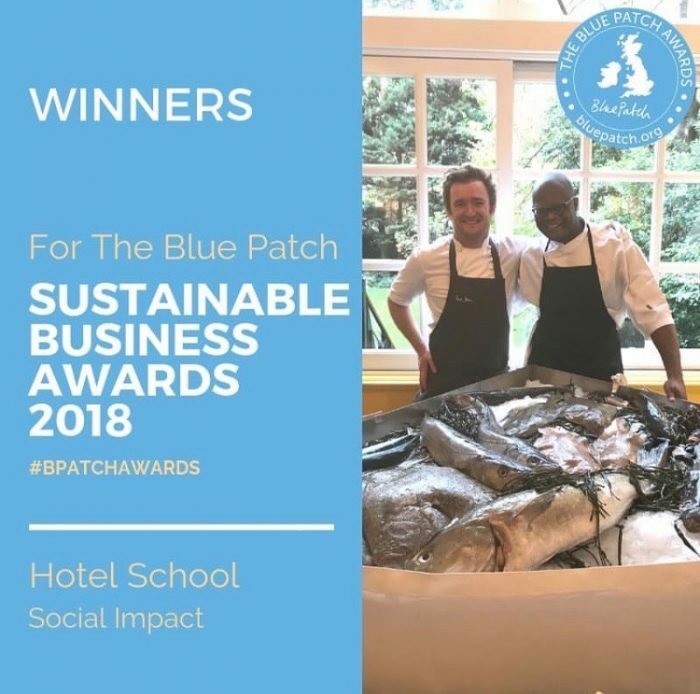 To round up an exceptional first year, Hotel School is delighted to announce that it has recently been named winner of the Social Impact category at The Blue Patch Sustainable Business Awards 2018! To find out more about Hotel School, please contact Fran Gosling.